Summer 2008 - More Painting! 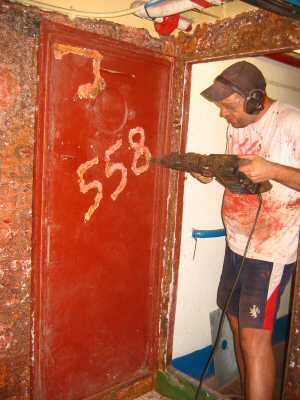 Towards the stern of the ship, was a seldom used room, just off the rear portside stern exit. At some time in the past it had been christened as the dog kennel, a name which has stuck, even though Raffles the ships dog from 1983-1989 would generally sleep anywhere he felt like it. In 1987 the room was used to house the antenna tuning unit (ATU) cabinet for the shortlived glass fibre antenna mounted on the back deck. 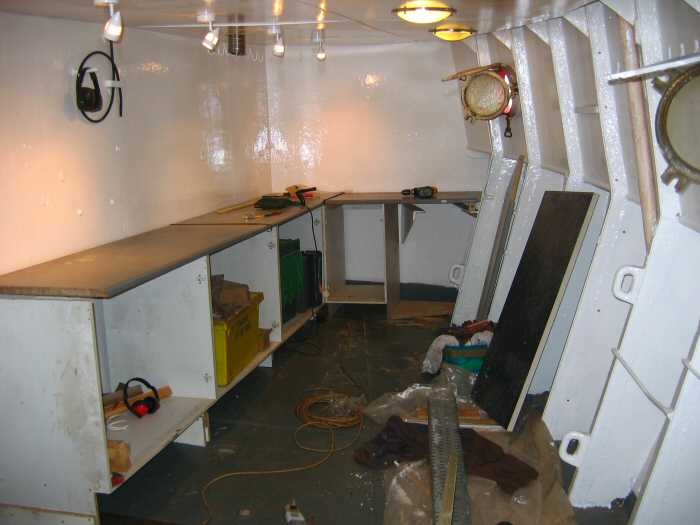 The ATU was a large aluminium cabinet, about 6 feet tall and deep, and 10 feet long. It took up most of the room and must have been some feat to have built in such a confined space, requiring oxy-cutting a section out of the door and wall to get it in. Due to the RF involved when the antenna was live the room could not be used for any other purpose at that time. Most of the innards of the ATU cabinet were removed in August 1989, but the cabinet itself and the frame upon which it was mounted remained. 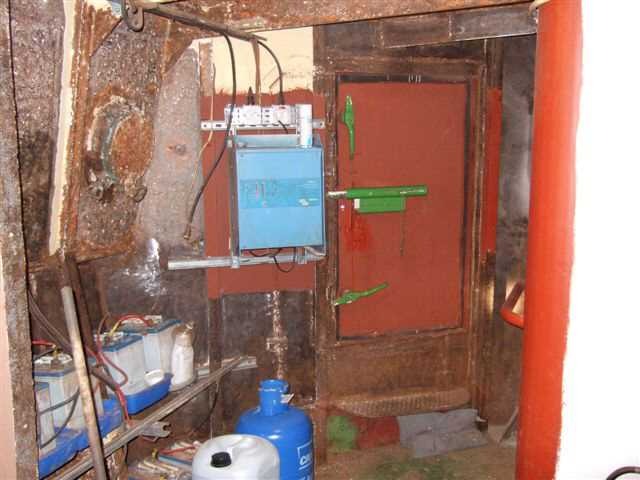 It slowly became full of junk, and was used for a while to house the ships 24 volt emergency lighting batteries. Throughout much of the 1990's getting into and out of the room required clmbering over all the junk, although the passageway was always kept clear. 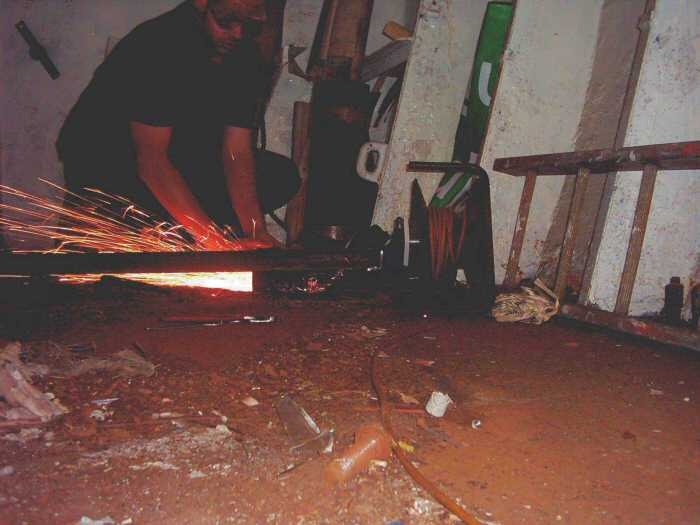 Lee, cutting the remains of the ATU cabinet frame from the floor. The cabinet has been removed by this time, leaving rubbish, broken glass and general junk all over the floor. During the 2004 Tilbury RSL it became obvious that using the messroom or chartroom as a merchandise shop was inconvenient, due to the number of visitors attending, and the number of crew who needed somewhere to relax. With the large number of visitors coming to the ship, we were also running into congestion along the main corridor when conducting tours, so having access to the rear door and the portside of the deck meant we could introduce a circular route around the ship. 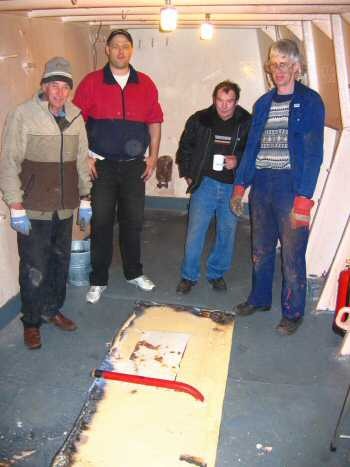 This was first implemented over the Easter 2005 weekend, when BBC Essex were onboard. Thus, it was decided the junk should be disposed of and the room converted into a shop and office type area, with surface area to show goods, and plenty of storage spaces. Refurbishment would also open up an extra area of the ship to visitors, and allow us to easily use a circulr route around the ship when needed. 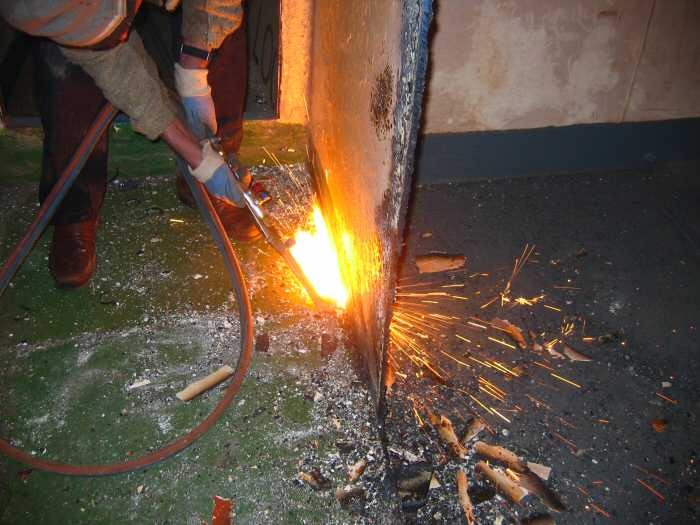 The first tasks which were undertaken were to relocate the lighting batteries onto a new custom made steel framework, and remove the sides of the cabinet by cutting into smaller sections which could be removed through the doorway. 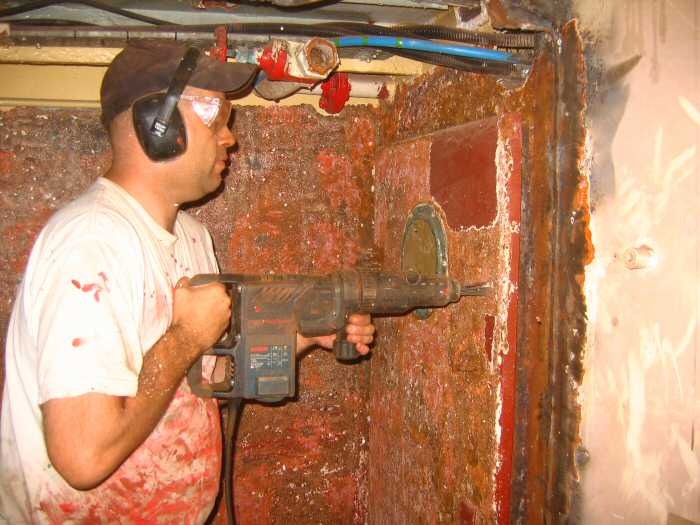 The main part of the room could then be sanded back to clean metal, re-primed and re-painted. Between the room and the passageway is a thin steel wall. There is no door - just a gap at the end of the wall. In order to make best use of the available space, we decided it would be best to cut the wall out, thus opening up the room. The wall was used as a mounting point for the battery charger, which had to be re-located. 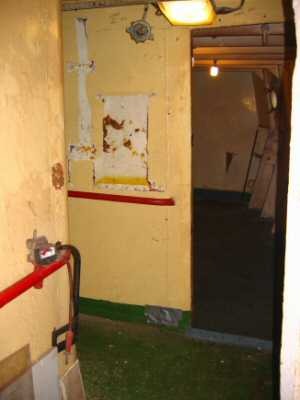 The left pictre shows the view in from the deck door, showing the end of the wall and the old location of the charger. On the right, you can see the rear of the wall, and out through the deck door, including the new location for the charger. 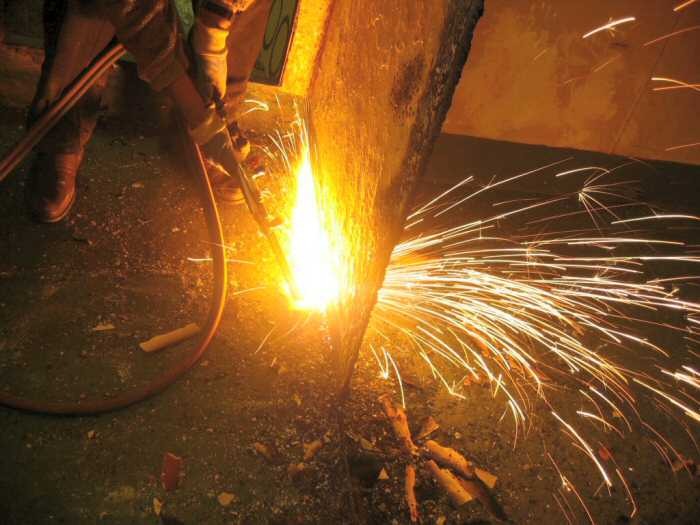 Our friend and supporter Dave Lockyer of Lockyer Motors in Orpington and his friend Jerry did the honours one February weekend in 2006, by bringing along his oxy-cetelene welding kit and cutting torch. For reasons of weight and logistics we cut the panel into two sections which could be safely man handled. Jerry - starting the cut along the top edge. With the first section cut out, Jerry starts along the lower edge of the remaining panel. L-R: Jerry, Lee, Dave Lockyer, Dave Noakes. 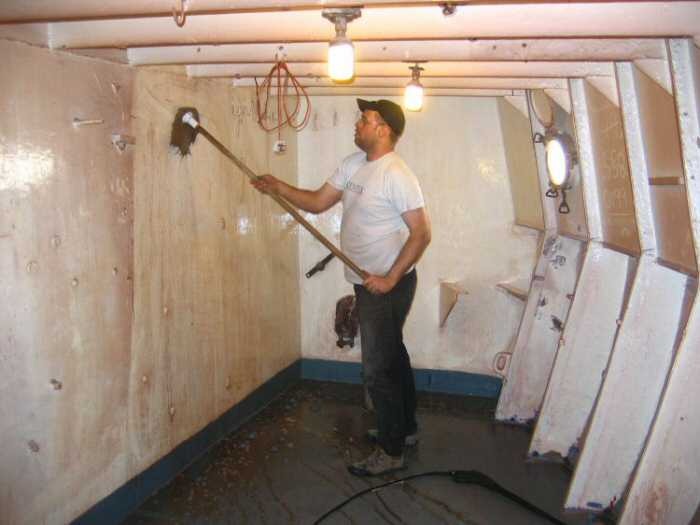 Into the summer of 2006 we left the interior of the dog kennel in pretty much a shell state and concentrated our efforts into the outside of the ship as described elsewhere. However, on the occasional rainy weekend we worked on cleaning up and repainting the back deck overhang, and chipped the "babypuke yellow" paint off of the walls of the passageway, ready for repainting. It was into the winter of 2006/07 before we started in earnest again on the kennel. 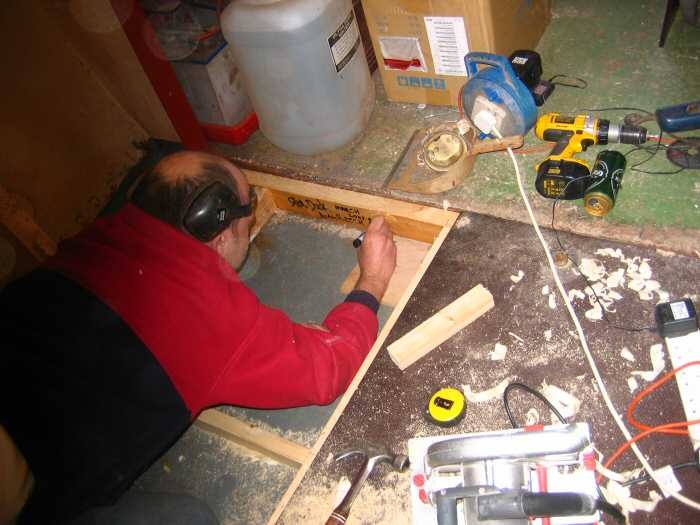 The step between the passageway and room had to be ramped, which was a job for ace carpenter Steve Dack, and at the same time we built a wooden frame onto the metal beams to hold a false wooden ceiling. 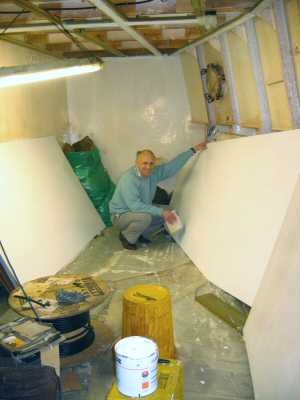 December 2006 and most of the paint has been removed from the old passgeway area. The original general purpose battery charger has now been replaced by a new (freely donated) one, designed for charging marine batteries. Note the weld marks directly above and below the charger (down to the Calor gas bottle). 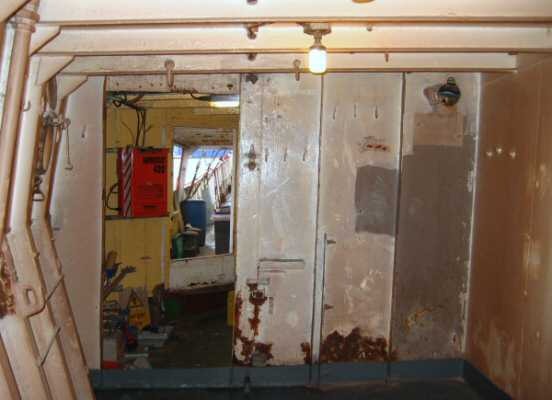 These are from when the entire wall and door had to be removed and then welded up again at sea in order to get the ATU into the room. Considering the immense effort to do just this aspect of the project, the disappointment at the short life of the glass fibre antenna must have been soul destroying. 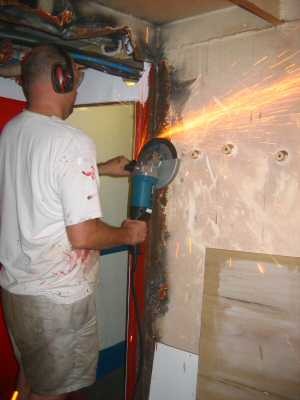 Lee using the big grinder to remove the rough edges left by the cutting torch. Using the Bosch GBH 4 needle gun to remove the paint on the door. 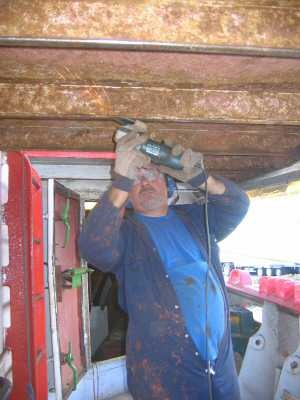 Whilst Phil prepares the deck overhang outside the kennel for repainting, Lee plays "Spot the Anorak" on the door. Steve makes a mess whilst building the ramp into the kennel. Note the battery area has now been primed with red oxide, ready for repainting. Lee adds his tag to the underneath of the step, alongside Steves. I wonder when someone will rediscover them? With all the recent work - welding, chipping, grinding and carpentry, some cleaning of the previousy painted walls is required prior to final fitting out and repainting. 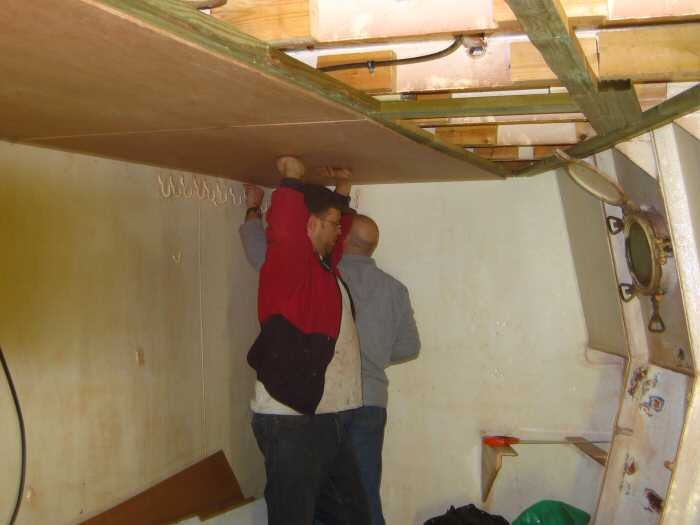 With the wooden frame in place, Lee and Steve start to place and cut the plywood panels which will go to make the ceiling. 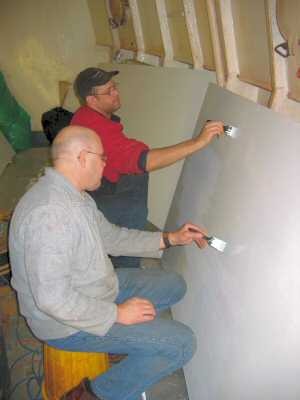 Lee and Steve start to paint the panels, whilst Roland sands them lightly for the final coat. 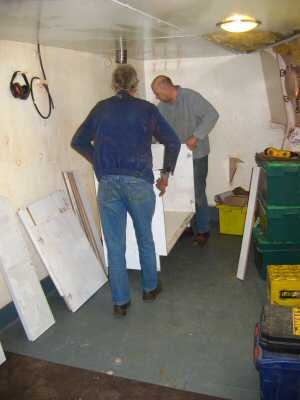 Steve and David start to position the cabinets which will make up the new shop area. The cabinets were all donated to Caroline by Lee's employer, Sentek, of Braintree. 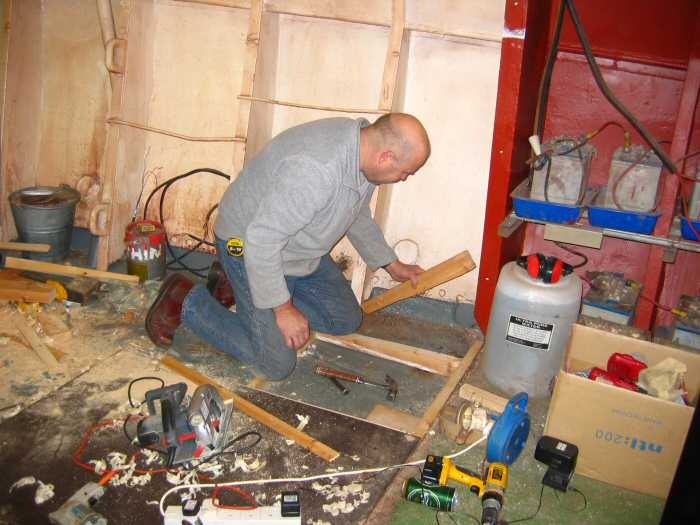 Steve, with several cabinets in place works on the tricky bit round the corner. Cabinets in, and worktops placed on the top ready for securing. Most of the work in the kennel was undertaken using freely donated materials and time. 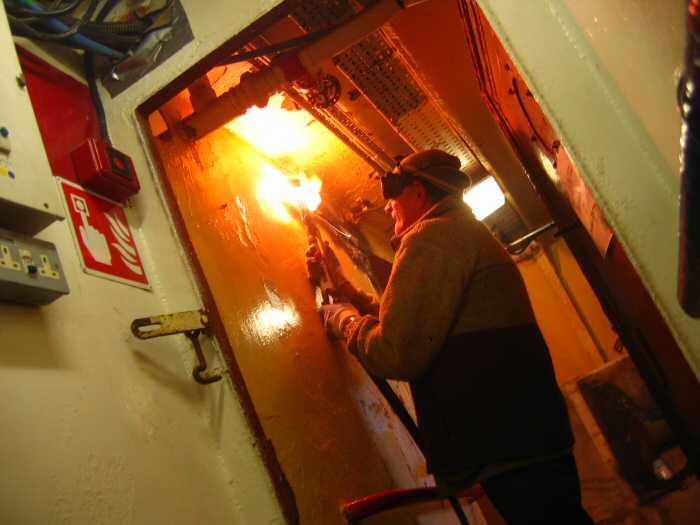 However, the new lighting was paid for by a donation from the Tony Allan memorial fund, and a plaque will be fitted to this effect before the ship is opened to the public. The void space between the ceiling and the deck was fitted with copious amounts of insulation in an attempt to keep the area at a reasonable temperature during winter and summer. As the shop assistants will have to spent most of their day in here, we want it to be a comfortable place to be. 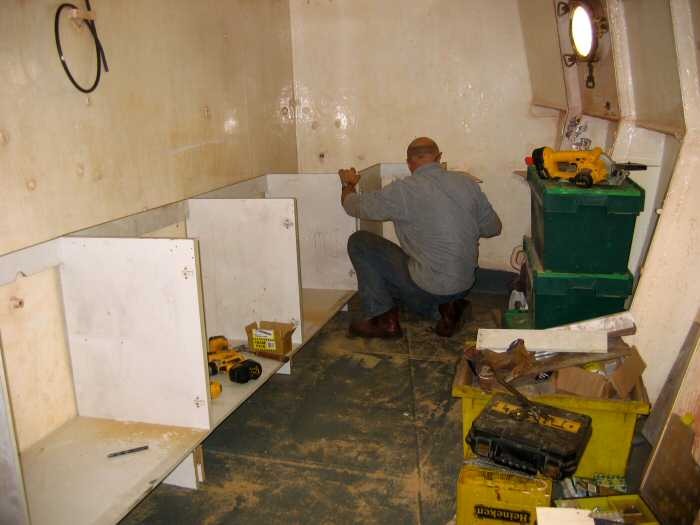 Since these pictures were taken the doors have been fitted to the cabinets, the end closest to the passageway has been finsihed off, and we are contemplating fitting some shelves along the outside wall of the ship. Watch this space for more updates!